You are here: Home » A cluttered desktop on your computer? Get some Fences! A cluttered desktop on your computer? Get some Fences! I like a clean desk. Both physically and virtually. Many will be familiar with the above situation where all shortcuts, files and folders are basically just dumped on the left side of the screen. Sometimes we organise them but often they just stay where they fall. Often the number of items growing until the complete screen gets filled up with icons making it hard to find anything. How nice would it be to be able to put some structure to this? Organise logically, illogically or any way you wished to group them? Would you like to be able to hide them when doing a presentation from your laptop or even just when someone is sitting beside you at your desk as you both work on something? Well you can! A little product called Fences. In the shot above you can get a sense for what it offers. You can create, size and name fenced areas of your desktop where your icons reside. 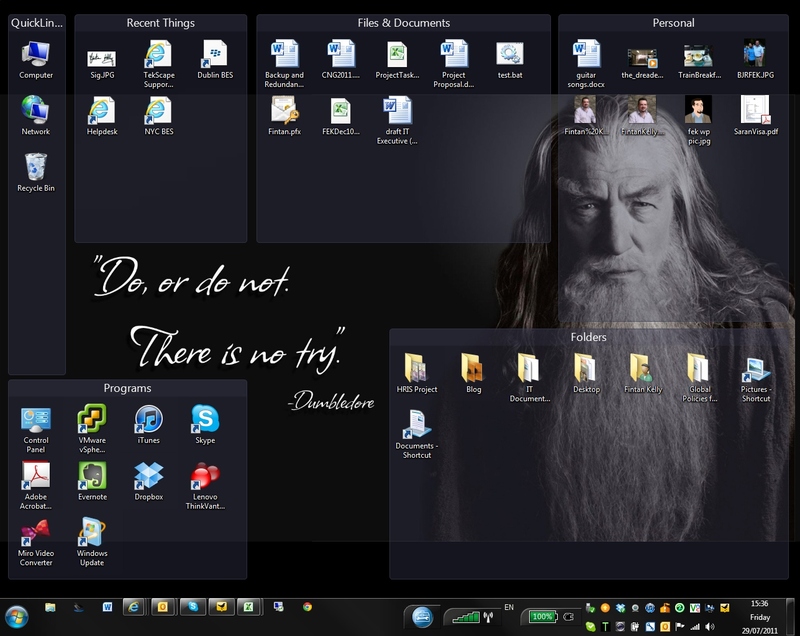 You can resize the areas as you need and keep areas of your desktop clean as I have above. You can control the opacity of the fenced area. The icons stay within each area unless of course you move them back to your desktop or to another fence so the fences are not just an image they are actual containers where the icons reside. Move a fence and the icons move with it! With a double-click of the mouse anywhere on the desktop the fences and icons all disappear and you are left with a completely clean desktop as above! Another double-click and they return. I love this feature for doing presentations as it means I can have a clean desktop on display and not worried be about what is sitting out on top. The same applies to situations when at my desk or sharing my desktop with a colleague in another office it’s just a double-click and everything is gone. Side Note: I get the pic and the quote so please no corrections on how it is in fact incorrect. I just like it. It brings a smile to my face. I can’t recall where I got it but a search on the web returns many sources. So to whoever created it congrats and thanks. This hasn’t got old for me yet! ← The iPad – what can make it a tool as opposed to a toy! That is a pretty interesting organizational tool. 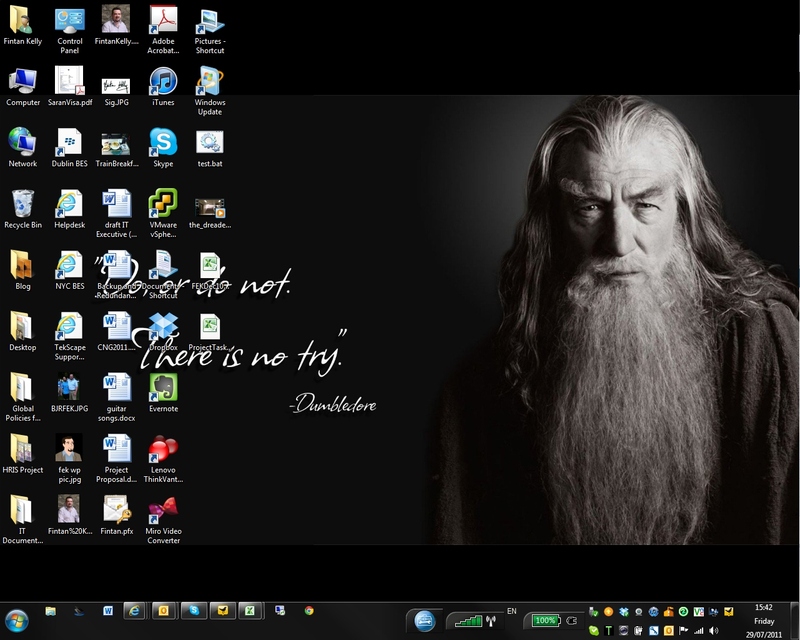 I personally try to really cut down on the number of icons I have on the desktop in general. I find this very helpful. However, I do like the idea of “fences” or groups of icons. I may just have to give this a try. I know this web site offers quality based articles and other stuff, is there any other site which presents these kinds of stuff in quality?